See the complete line of VHC Brands, including purses and wallets by Bella Taylor, tabletop by Nancy's Nook, curtains, quilts, throw pillows, rugs, Christmas decor, and tons more! 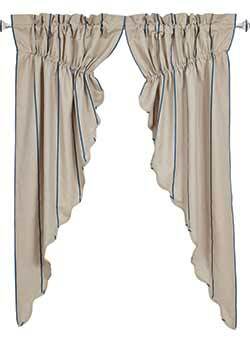 With contemporary, boho, country, primitive, lodge, patriotic, floral, and romantic style, there's something for every home! 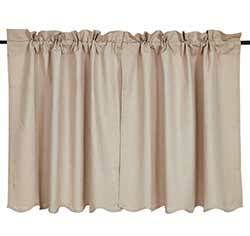 Charlotte Slate 63 inch Curtain Panels, by Nancys Nook for VHC Brands. 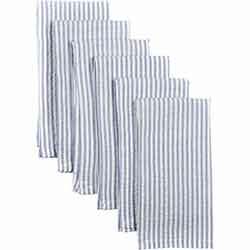 Features vintage style feedsack striping in slate grey, perfect for the farmhouse home decor look! 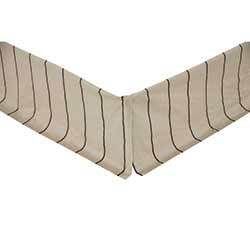 Charlotte Slate Bed Skirt, by Lasting Impressions. Charlotte Rouge Bed Skirt exudes European charm, with a slate grey pencil stripe print on a luxurious blend of linen/cotton (Belgium linen weight – 50% cotton, 50% linen). 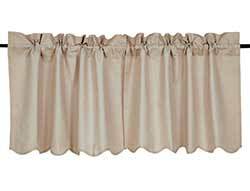 There is 3 inches of matching fabric on the decking, an added “decorator” look not found in most brands. Finished with split corners. 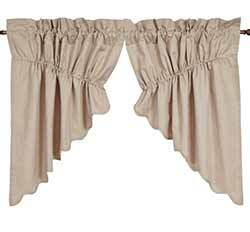 Available in Twin, Queen, or King. 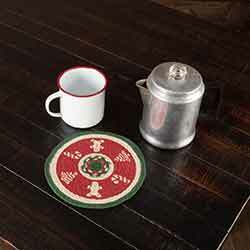 Charlotte Slate Cotton & Linen Table Topper, by VHC Brands. 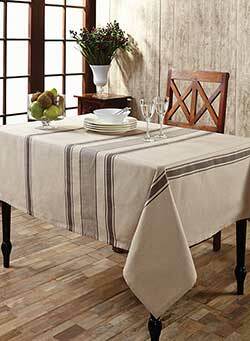 Decorate your country kitchen with this striped table topper for a farmhouse look! 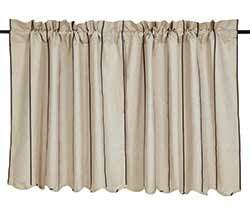 50% linen and 50% cotton blend. 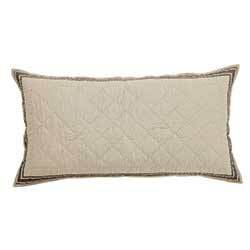 Charlotte Slate Pillow Cases (Set of 2), by Lasting Impressions. 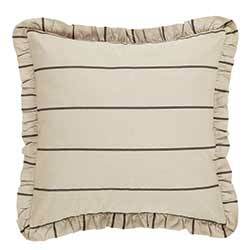 Charlotte Slate Pillow Case Set exudes European charm, with a single printed slate grey grain sack stripe on an ultra-soft cotton voile. 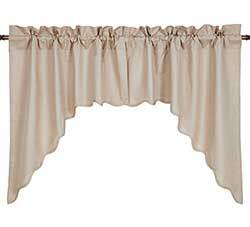 Charlotte Slate Prairie Curtain (63 inch), by Nancys Nook for VHC Brands. Features grainsack striping in slate grey, perfect for the farmhouse home decor look! 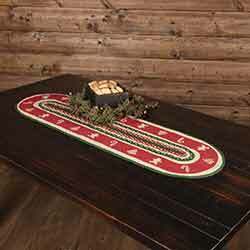 Charlotte Slate Prairie Swag (36 inch), by Nancys Nook. 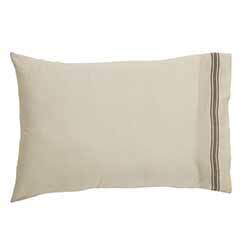 Features grainsack striping in slate grey, perfect for the farmhouse home decor look. 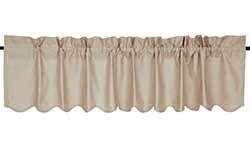 Charlotte Solid Natural Cafe Curtains - 24 inch Tiers, by Nancys Nook. 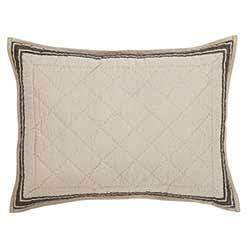 Charlotte Solid Natural Scalloped Tier Set coordinates with Charlotte bedding and is a greige, luxurious linen/cotton blend known as “Belgium weight” meaning equal parts cotton and linen. 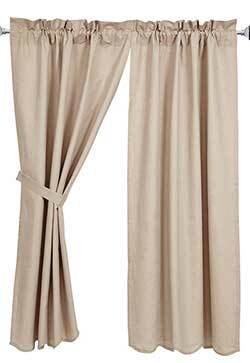 Charlotte Solid Natural Prairie Curtain (63 inch), by Nancys Nook. 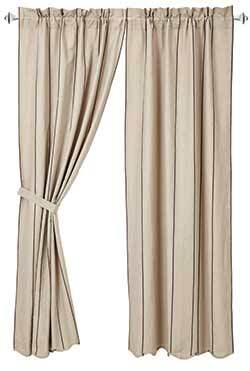 Luxurious cotton linen blend fabric in a grey / beige color, perfect for the neutral living room or kitchen! 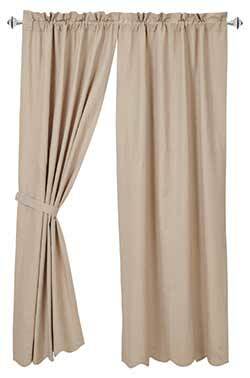 Charlotte Solid Natural Prairie Swag (36 inch), by Nancys Nook. 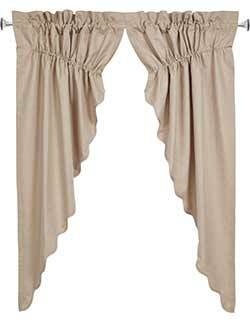 Luxurious cotton linen blend fabric in a grey / beige color, perfect for the neutral living room or kitchen! 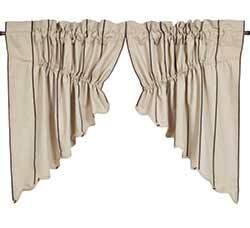 The soft seersucker used to make our Chelsea Blue Napkin Set is matched with traditional seersucker white. 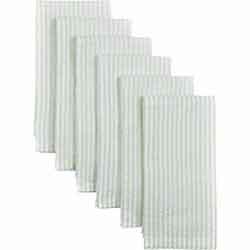 The soft seersucker used to make our Chelsea Mint Napkin Set is matched with traditional seersucker white. 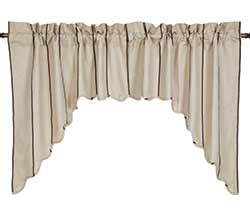 Cheyenne American Red Sham - Standard, by Ashton & Willow. 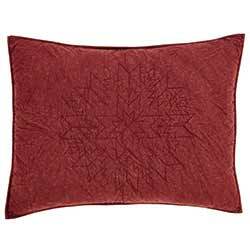 Dress the bed in Cheyenne American Red Standard Sham for an urban rustic look featuring two intricately quilted feathered stars. Finished with a special wash process to give a distressed look. Cotton shell and batting, with 3-tie closures on the reverse. 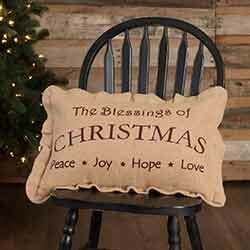 The 14x22 Christmas Blessings pillow lists the four qualities of peace, joy, hope, and love in stenciled burgundy on soft but textured jute burlap. 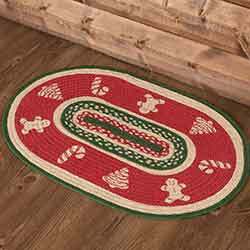 The Christmas Cookies 36 inch Table Runner brings out Christmas cheer and fond memories of fresh baked treats and family gatherings. 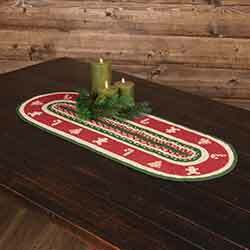 The Christmas Cookies 48 inch Table Runner brings out Christmas cheer and fond memories of fresh baked treats and family gatherings. 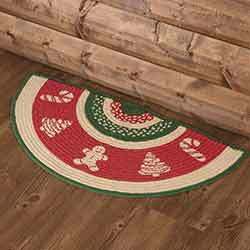 The Christmas Cookies 48 inch Tree Skirt brings out Christmas cheer and fond memories of fresh baked treats and family gatherings. 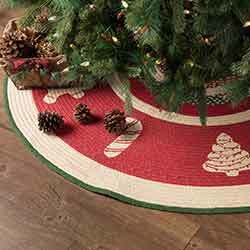 The Christmas Cookies 55 inch Tree Skirt brings out Christmas cheer and fond memories of fresh baked treats and family gatherings. 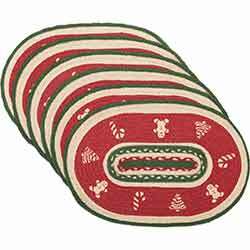 The Christmas Cookies 60 inch Tree Skirt brings out Christmas cheer and fond memories of fresh baked treats and family gatherings. 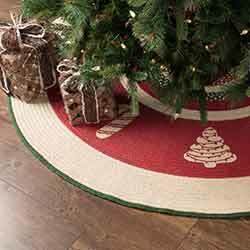 The Christmas Cookies Half Circle Rug brings out Christmas cheer and fond memories of fresh baked treats and family gatherings. 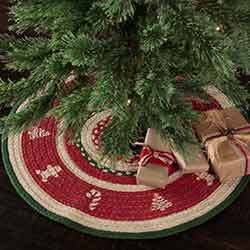 The Christmas Cookies 21 inch Mini Tree Skirt brings out Christmas cheer and fond memories of fresh baked treats and family gatherings. Candy canes, Christmas trees, and smiling gingerbread men - the perfect combo to put you in the mood to celebrate the Season. Candy canes, Christmas trees, and smiling gingerbread men - the perfect combination of holiday goodies to put you in the mood to celebrate the Season. 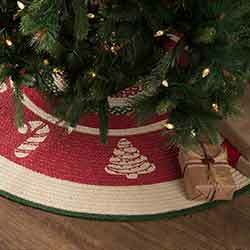 The Christmas Cookies Rug brings out Christmas cheer and fond memories. The gift of wine can often have significant meaning. 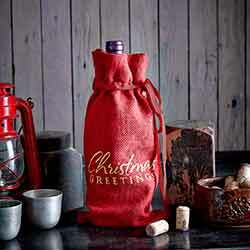 Bundle this gift in our Red Burlap Wine Bag Christmas Greetings to add a touch of elegance to your wine bottle. 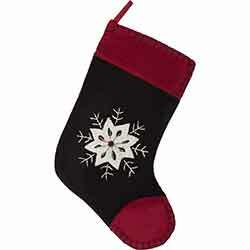 The cherished design of our Christmas Snowflake Stocking Felt Embroidered embodies an heirloom look that makes a house a home for the holidays. The Christmas Snowflake Felt Embroidery Runner (8x24) embodies an heirloom look that makes a house a home for the holidays. The design of our Christmas Snowflake Placemat Set embodies an heirloom look that makes a house a home for the holidays. The design of our Christmas Snowflake Round Placemat Set embodies an heirloom look that makes a house a home for the holidays.